Antheraea assamensis Helfer, popularly known as Muga silkworm, the golden silk producer of northeast India is economically important and unique among the Saturniid silkworms. In this study, the genetic diversity and phylogeny of semi-domesticated and wild morphs of Muga silkworm collected from different geographical locations of northeast India were investigated based on the sequences of five mitochondrial loci, i.e. 12S rRNA, 16S rRNA, CoxI, Cytb and CR. All the five mitochondrial loci showed a strong bias towards higher ‘A’ and ‘T’ contents. Transitional substitutions were found to be more than the transversional substitutions. 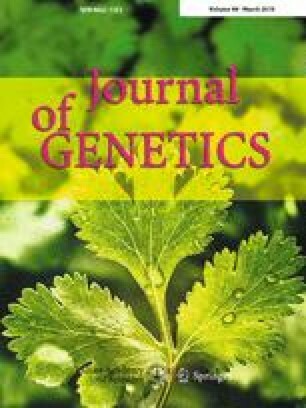 The rate of nucleotide substitution and average genetic divergence were found to be highest in CR sequences and lowest in 12S rRNA gene sequences among the morphs of Muga silkworm. The morphs collected from same geographical area had identical 12S rRNA, 16S rRNA, CoxI and Cytb gene sequences. Moreover, the 12S rRNA and 16S rRNA gene sequences of some semi-domesticated and wild morphs collected from different geographical locations were also found to be similar. In the phylogenetic trees generated based on the mitochondrial loci, mixing of semi-domesticated and wild morphs was observed as they shared the same group. The information generated in this study will help in formulating strategies to conserve the natural biodiversity present among these unique silkworms in northeast India. In addition, this will be useful in identifying diverse morphs of Muga silkworm, which will help in effective breeding programmes to improve its productivity. This research was carried out with financial support from the Department of Science and Technology, Govt. of India.